It was one unexpected day when the tree service came to our home and starts cutting down the trees. They were very busy that the driver of this humongous truck forgot where our septic tank located and accidentally popped the top lid of it. Of course, it was their mistake so they dug up the spot and yes, they've seen that they messed up the lid and need for a repair as soon as possible. The tank was there for about 50 years and it's been quite that long since the last time it was updated. And yes! By law we have to follow the rules for DOH's requirement for family health's safety as well. It wasn't in the budget for this year, unfortunately we need to call a septic service to do the work and to update the whole system in order to pass. Cha-Ching!!! Another Four thousand dollars were deducted from our savings that was supposedly for the roof repair for the apartment. Nevertheless, we need to attend a much needed attention and to fix the septic tank as soon as possible. The septic tank guy came and gladly even though the cost was very expensive, we are happy to see that it was done as soon as possible. Aside from the fact that the guy who did it was very nice and approachable, he also did the inspection schedule for us which makes it faster too. Torn down our yard and when they start digging, there we no stopping there. 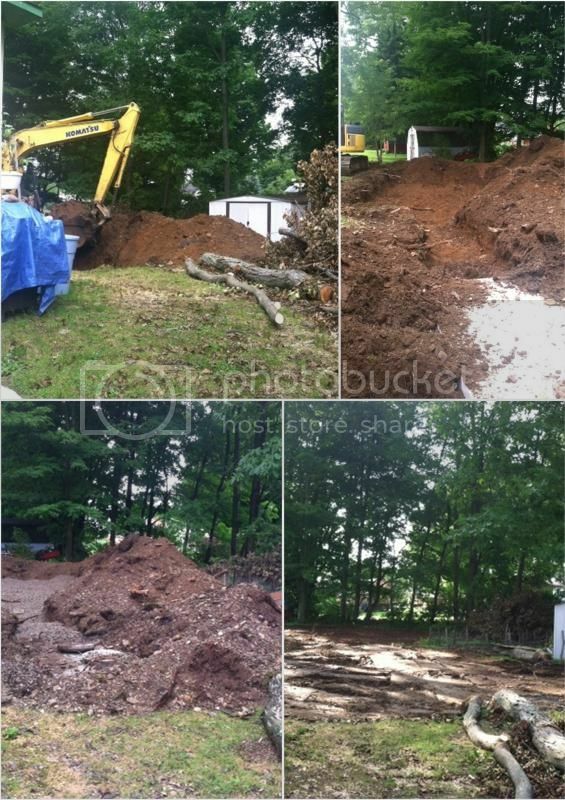 Dug up the most of our yard and as you might see it was a total mess. Other than the big branches laying in the yard there was another messy yard work. Took few pictures of what work to see and to remember when the time comes. At least now, we have one big project down and more to go in the future.